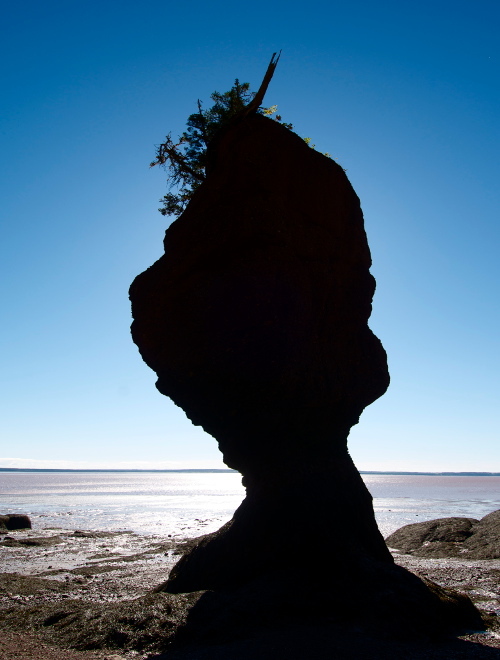 We saved the best for last with a visit to the Hopewell Rocks world heritage site. As part of the world heritage list, this place has been deemed a site of exceptional natural beauty, and significant to human understanding of geologic processes. 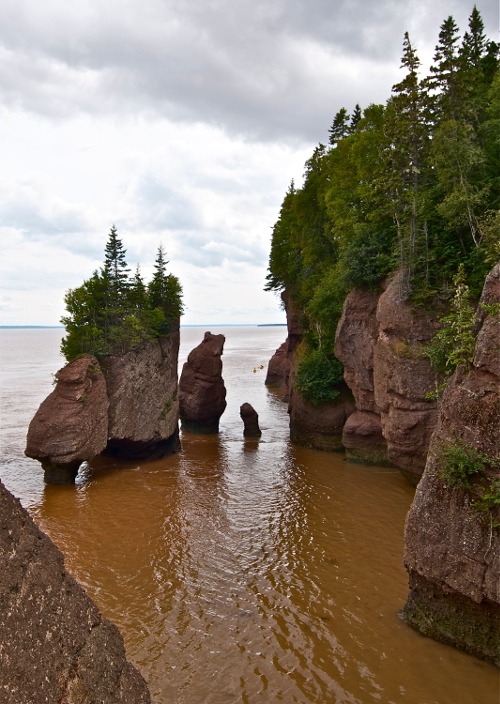 The flowerpots are formations that were formed by extreme water movements in the Bay of Fundy. At low tide, you can walk among prolific pinnacles and see mind-blowing evidence of the erosional forces at work in the bay. When the tide rolls back in, it becomes a premiere destination for a little ocean kayaking. Pictures barely do justice to these hulking monoliths sculpted by the sea. To better understand the scope, here is a sneak preview of the tidal exchange in time lapse. To get the fullest effect, keep your eyes trained on the people as they move through the area. The opportunity to visit Canada, take in some of its natural wonders, commune with the whales, and interview cutting edge experts has been a genuine privilege. None of it would have been possible without the help and support of our generous backers. We are still at the very start of the journey with many hours of editing ahead and much more filming to do, but we look forward to bringing you more stories and images from the microcosm very soon! It’s hard to believe that our time in Canada is coming to a rapid close. 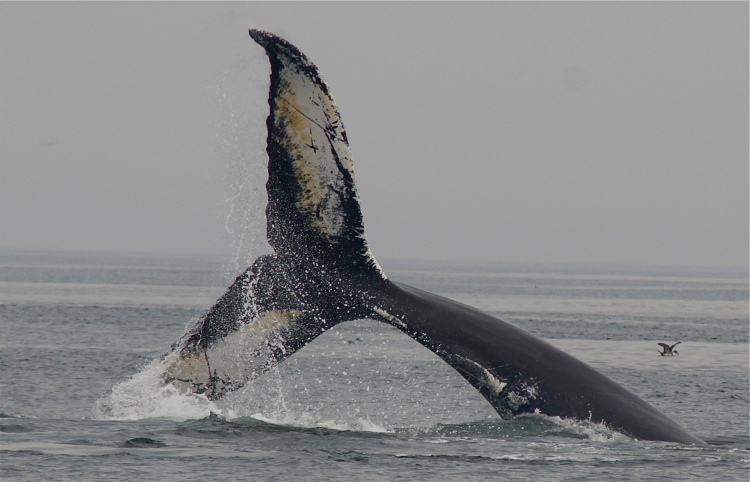 We have met incredible people who gave tremendous interviews, Filmed and photographed the massive whales that feed on the microcosm, and the last piece of our puzzle pertains to the Bay of Fundy. Tidal movement through the Bay of Fundy is the largest in the world, meaning that when the tide comes in it rises and falls more meters than any spot on Earth. When the tide goes out it leaves massive areas of the ocean floor (and many inhabitants) exposed to the watchful beach walker. These water movements are also important to the microcosm. As plankton, microorganisms are drifters by nature. They can move up and down the water column, but are distributed throughout the ocean by the tides and currents that carry them. By studying and documenting these water movements, we can better understand the range and distribution of plankton and also the other marine life that feeds on it. Tonight will be a full moon and the tidal shift will be at its most extreme. However, when we woke up the first thing I saw was an ocean as flat as glass with almost no current running. Visibility was excellent without fog or wind…A perfect day for whales! As the boat chugged out we saw Bald Eagles, cormorants, and seals. An auspicious start to a legendary day! As if on cue, the moment we got to the whale grounds we were greeted by two humpbacks that decided to give us a good twenty minute performance entailing breaching, fin slapping, and fluke waving. It was an awe inspiring show that didn’t stop there. At least eight fin whales got in on the action and performed a synchronized swim routine. 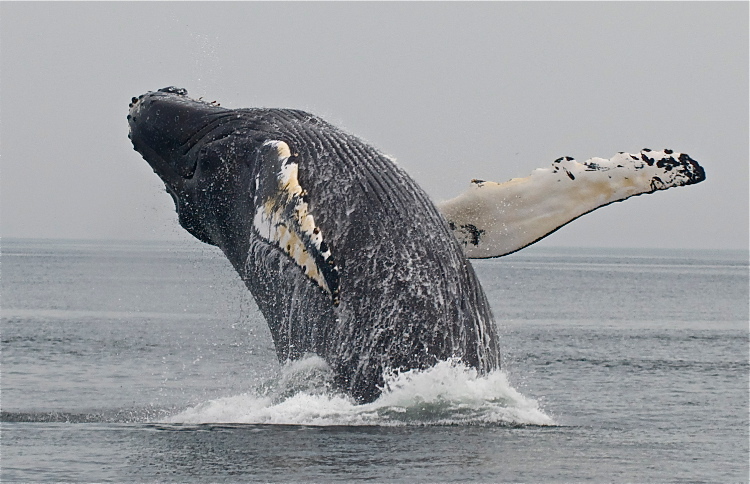 The humpbacks were clearly displeased at the blatant display of showmanship. Refusing to be upstaged, they came back for another round of fluke slaps and other antics. All too soon it was time to turn back, but on the way in we got to witness the infamous Grand Manan kelp harvest. It was early enough at port that we got to stop off at one of the local kelp dispensaries to sample the goods. The array was astounding and included familiar forms like nori, kombu, laminaria, dulse, and sea lettuce, but also things more exotic to me such as Irish moss, and alaria, each with unique tastes and textures. Finally back at our cottage the owners came down with freshly caught haddock, further proving that Canadians are about the nicest lot of folks you can come across. Another perfect end to the day in the microcosm! This trip has sort of been like “Great Outdoors” meets “Trains, Planes, & Automobiles” slash “National Lampoons Vacation”. On the one hand it is all about nature and experiencing simple things. On the other hand we have been logging crazy miles that have (at times) been a little trying and frantic. Either way, homage to the late and great John Hughes! Today we woke at 6:45am to meet a ferry that departed at 8am from Digby to New Brunswick so we could drive a little more to meet another ferry in order to drive to our destination in Grand Manan. I have never really been one to spend hours in a car, but I dare say…WORTH IT! 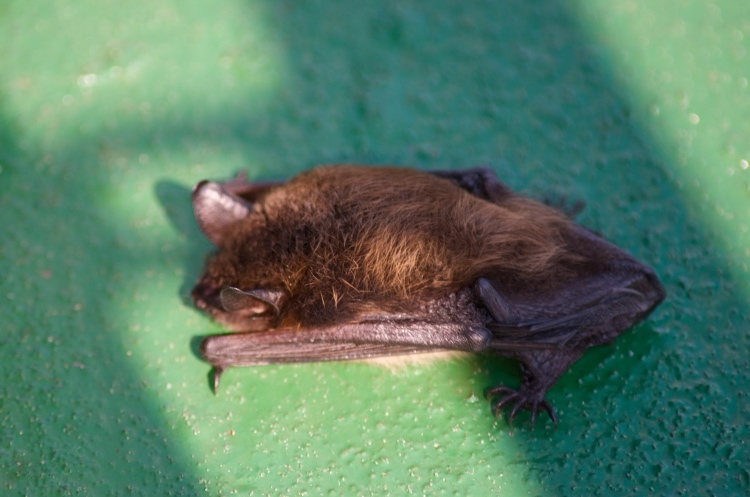 The most surprising revelation of our journey was the fact that little fruit bats are occasional stowaways on the ferries. Upon arrival in Grand Manan, time almost instantly slows. 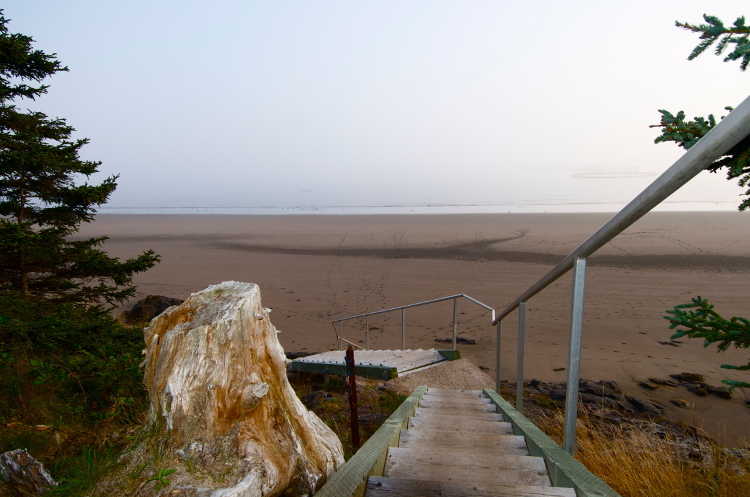 The island sits right in the middle of the Bay of Fundy and has a total population that numbers less than 2,500. Salmon farms and lighthouses characterize the picturesque coastline that is the favored playground of whales, basking sharks, and an epic variety of sea birds. Grand Manan is one of the greatest places on Earth to get fresh Dulse (a form of kelp) that can be eaten on its own or incorporated in to a variety of recipes. It is collected and dried in the fresh sea air and then shipped out all over the world. This place is filled with marvels to explore, and we are just getting started! Today we sadly left Peggy’s Cove to make our way to the town of Digby where we will catch a ferry, drive, and catch a ferry and drive some more to Grand Manan (this better be good MC). 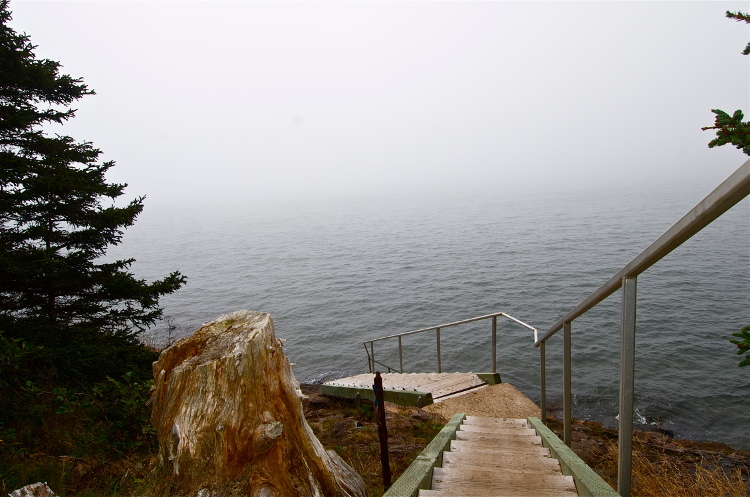 This was our first sighting of the Bay of Fundy and it was THRILLING. 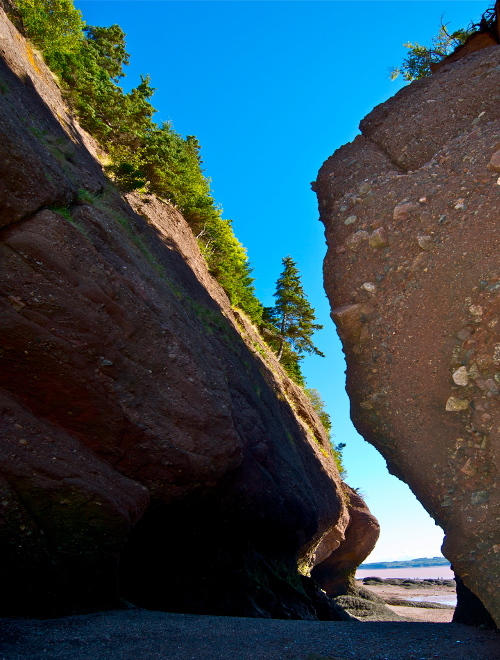 Fundy is a United Nations World Heritage site because it is considered to be of “outstanding universal value” and “superlative natural phenomena or an area of exceptional natural beauty and aesthetic importance”. 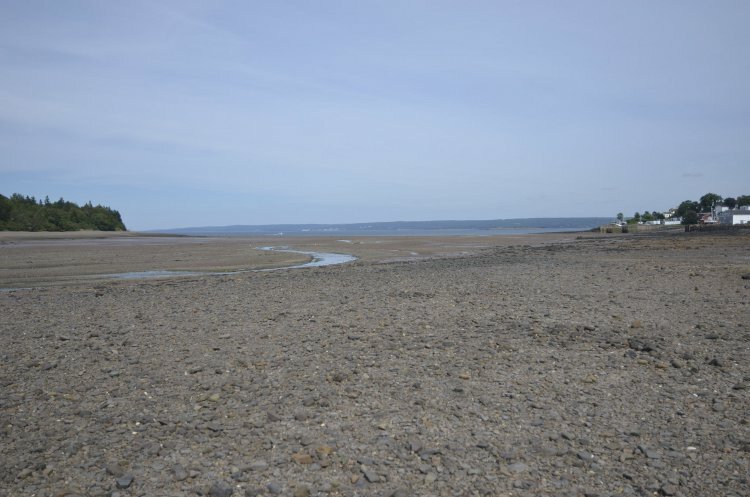 As it pertains to Microcosm, Bay of Fundy has the largest tidal exchange on Earth. Twice daily the tides rise and fall in the most extreme ways imaginable. 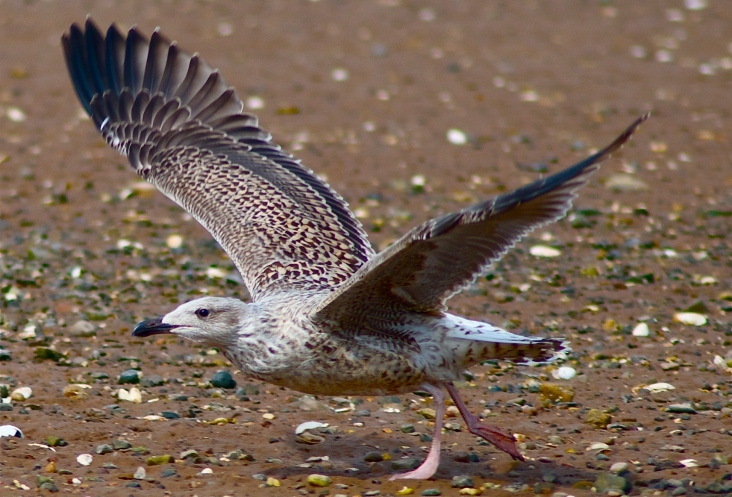 When the tide is out, it exposes vast areas of the ocean floor where you can walk and look for marine life capable of withstanding prolonged exposure to air (and the birds that swoop down to exploit it). My young son calls this event “Birdapallooza”. Eventually the ocean works its way back in to reclaim its land and the entire thing starts all over again. It is these types of large scale water movements that help move and distribute critical plankton masses throughout the global ocean. Tomorrow on our ferry ride we hope to witness some of the macrofauna (BIG ANIMALS) that are drawn to the area for this very reason. It should be a whale of a time in the microcosm over the next few days, so stay tuned! 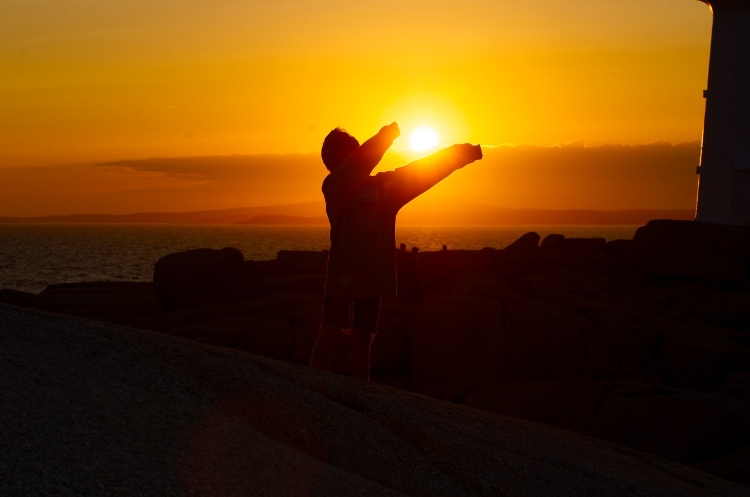 Tonight we departed Halifax and arrived at Peggy’s Cove in time to catch (literally) a smashing sunset. We are on our way to Grand Manan to try to capture whales (on film of course). 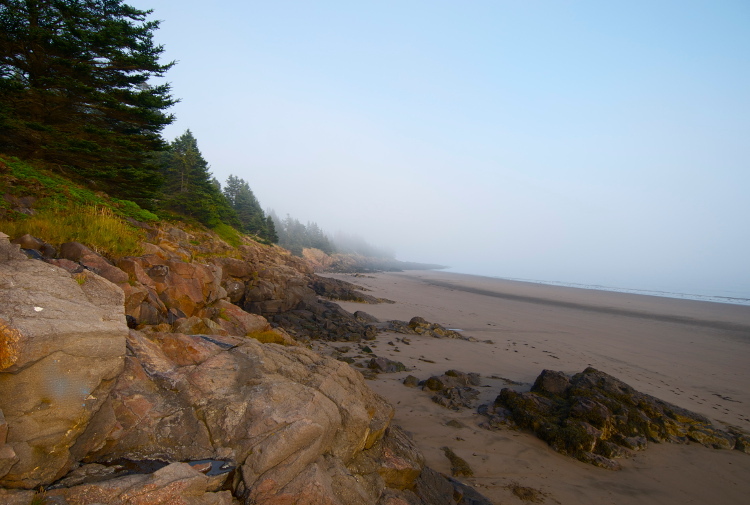 The journey will take a couple of days and bring us across some of the more remote parts of Nova Scotia’s backyard. Everywhere we look there is something spectacular to see. 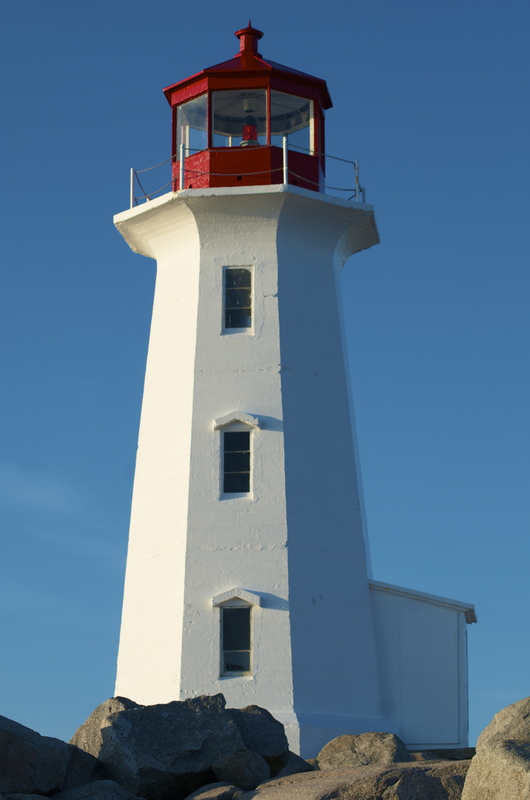 The lighthouse at Peggy’s Cove is one example that shines as a beacon over the water and symbolizes the resilience of this tiny town that less than 50 people call home year round (sort of a human microcosm really). This iconic landmark built in 1914 used to serve as the local post office until 2009. Equally profound is the unique and barren landscape constructed of enormous and perfectly smooth granite sheets and boulders that would make the most skilled stone mason jealous. This titillating topography was orchestrated by a complex series of geologic events in concert with erosion driven by water movements and storms. Because water can run easily over the rock face with little opposition, it carries vital nutrients to the bay below that help proliferate the abundance of planktonic creatures that support the whales that pass through for a snack. 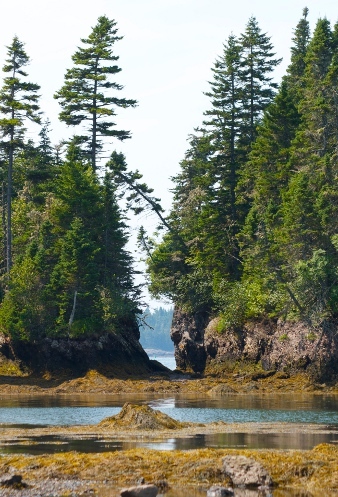 It is easy to understand why Nova Scotia earned its name that means “New Scotland” in Latin. When you stop to consider the epic fog that rolls in and out on a whim, the haphazard smattering of rocks, and combine it with turbulent tides and fog, it is little wonder that this is one of the best places in the world to come visit if you are a fanatic for lighthouses (and we are). Good night to you all from the microcosm! The time spent in Halifax over the past few days has been very special. Not only is it a beautiful place, the people here are incredibly kind and ready to point out the best things to see and do. We had some fun at the Maritime Museum of the Atlantic and riding the amphibious Harbor Hopper, but of course there was work (if you can really call it that) too. 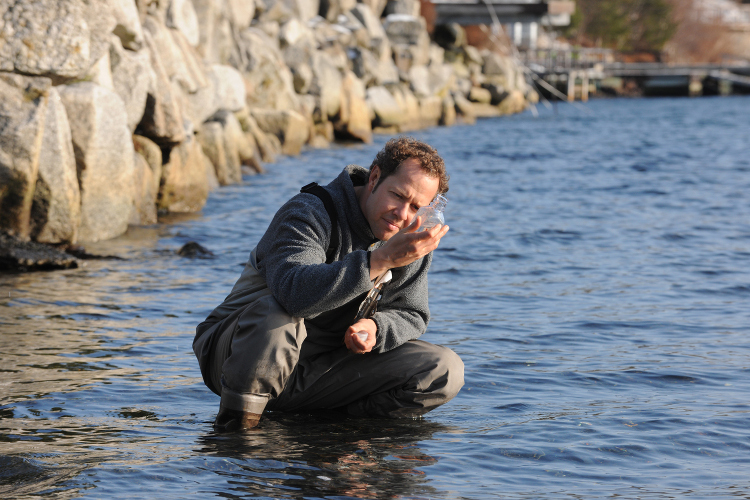 At Dalhousie University we met with famed fisheries scientist Dr. Boris Worm who studies the economy of ecosystems. He talked with us about the critical nature of sea surface temperature and the connection it has to the abundance, biodiversity, and distribution of our microcosm. Dr. Worm also gave us very revealing insights into how modeling the historic temperature patterns of the ocean will help us to look forward in the face of climate change. There was so much more insight to share, but we can’t give it all away! Our next expert was young innovator, scientist, and mathematician Mather Carscallen who is building a company dedicated to generating algae based fuels aimed at the aviation industry. Mather’s company SabrTech is on the cutting edge of a new fuel economy that is based around what he once saw as “pond scum” and now sees as a beautiful fascinating part of nature, and also a turn key for green job generation and a better, cleaner environment. Mather talked about his vision for the company going forward, but you will have to wait for our film to learn more! Talking with Mather reminded me of Dr. Ian Malcolm from Jurassic Park. He can make you laugh and simultaneously send your head spinning with his intellectual knowledge, a fun and rare commodity to be sure! 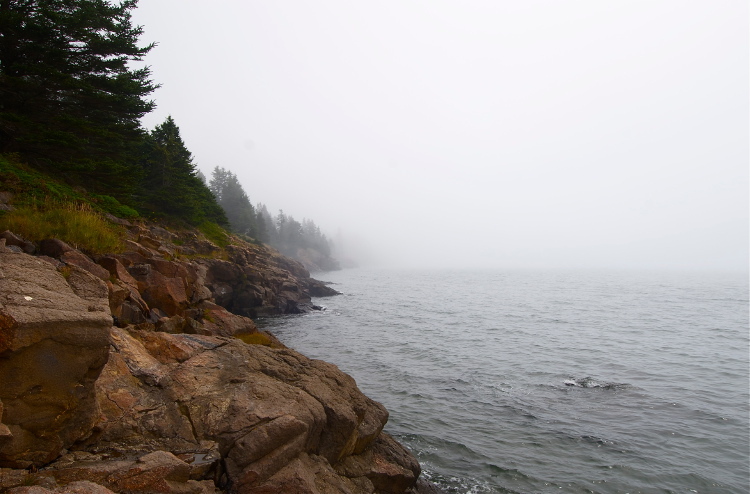 Today we will hit the road to Peggy’s Cove, so stay tuned for the next installation in the making of Microcosm! 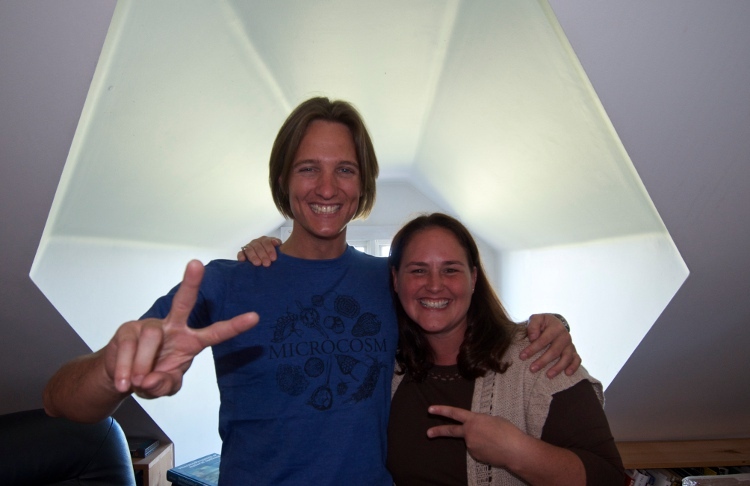 Mather Carscallen with Michele Hoffman-Trotter.